In our last post we talked about the ATSSA “Tuesday Topics” webinar held June 27th. Joe Jeffrey began the webinar with a discussion of work zone ITS basics. Chris Brookes of Michigan DOT shared some of his lessons learned. The final speaker that day was Ross Sheckler of iCone there to talk about coming trends in work zone ITS. Ross declared that the next big thing will be queue warning combined with dynamic late merge. Mr. Sheckler began by looking at the state of our industry. He said that nationally there are nearly 1,000 deployments per year now. Costs of these systems are dramatically lower than they once were. And the economy and simplicity of these systems have not affected their flexibility. In fact, because applications vary, flexibility always has been and always will be an important feature of work zone ITS. And for that reason it is very easy to add features, including dynamic late merge. As Ross pointed out, queue warning systems have their limitations. When volumes increase and queue lengths extend beyond the limits of a queue warning system additional steps should be taken. By instructing drivers to stay in their lanes and take turns at the merge point, it reduces the overall queue length, makes the best use of limited capacity, reduces road rage, and sometimes can even improve throughout. In his drawings of typical system configurations he listed 4 sensors and 1 portable changeable message sign (PCMS) for queue warning. 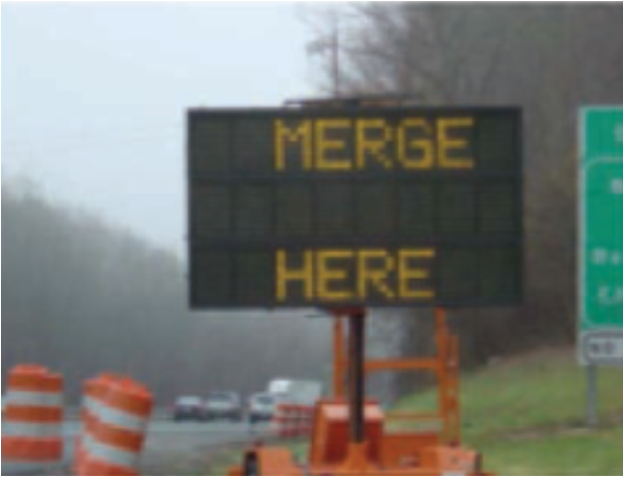 For queue warning with dynamic late merge he added a second PCMS at the merge point to tell drivers to take turns and a fifth sensor to narrow the gap between sensors midway through the affected area. So, in total, just 1 more sensor and 1 more sign. This is a minimal added cost and significantly increases the capabilities of the system. The message here is that we can often solve multiple problems with one system. It just takes a slightly different logic in the controlling software. In this case you can solve problems with end of queue crashes and conflicts at the merge point with one inexpensive, easy to use system. So please remember this the next time you specify a work zone ITS system. Consider all of the challenges you face on that project, and think about ways work zone ITS may mitigate one, two or perhaps even many of them. This webinar covered a lot of ground in a very short time. It was recorded and can be viewed by ATSSA members anytime at: http://www.atssa.com/TuesdayTopics/Recorded. Or watch for possible future webinars on this same topic. Mr. Sheckler also explained that most closures are never reported. And of those that are reported, most don’t occur on the dates and times they are scheduled. He went on to say that the most dangerous closures are probably those unreported ones. He used the example of a short term utility closure on a rural road with bad line of sight. The people doing that type of work often do not worry much about traffic control. They might place a 10 foot taper of cones and a ROAD WORK AHEAD sign, but even that is somewhat rare. 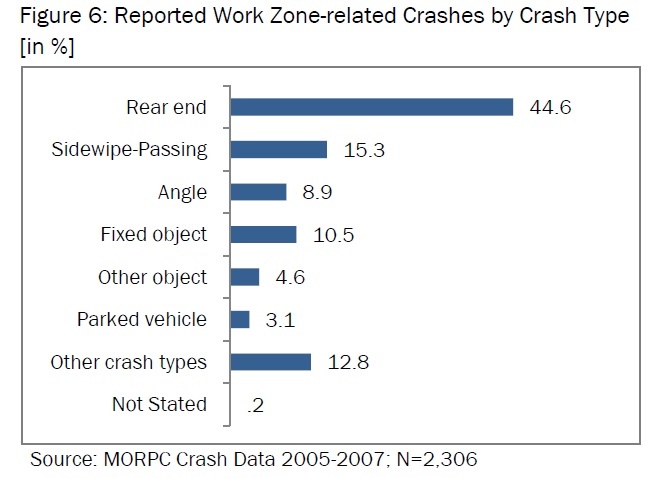 Automotive systems must be able to recognize these work areas and react appropriately. And when traffic control is reported, it only shows up in navigation apps as “roadwork”. It does not say it is a lane shift, or multiple lane closure sure to cause queuing. It does not say the entire geometry has changed by moving traffic over into the oncoming lanes separated by concrete barrier. And it does not tell you if the work is causing traffic to slow or stop. A shoulder closure is reported the same way as a full roadway closure with detour. Yet one does not affect traffic at all while the other may affect travelers’ choice of routes. His point is that by reporting these changes as they occur it gives drivers the opportunity to avoid the area altogether. But the information must be posted as the changes occur and it must be accurate. If it is, drivers will learn to depend on it and change their routes. But if they get erroneous or inaccurate information, they will continue to drive along their intended path. Ross finished by listing the details that are important to navigation apps, and this applies to current apps as well as future autonomous driving systems. Work zone status: scheduled versus equipment on sight and ready to work versus workers present. Map changes including lane shifts, capacity reductions of any kind, or roads closed. Queue details including slow or stopped traffic, delay times, early or late merge systems, and location of merge point. Presence of active flagging operations including location. Presence and location of attenuator trucks, especially when the attenuator is in the down or active position. These are all details a system will require to make informed routing recommendations. And if the work does cause significant impacts, we prefer they avoid the area altogether. It is safer and more efficient for everyone involved: travelers, contractors, and for the owner/agency. Our industry can supply this information today. So please encourage system designers to engineer with that in mind. We can all avoid a future full of expensive, time consuming, and even dangerous problems by getting the word out now. 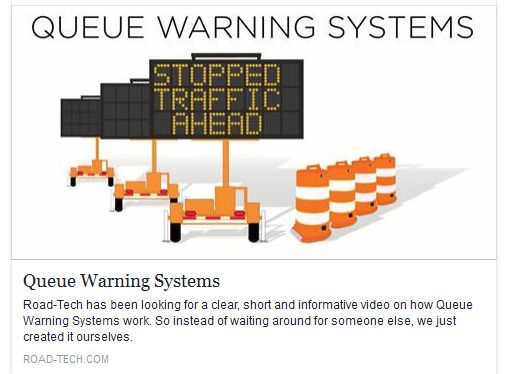 The folks at Road-Tech Safety Services put together a great animation explaining queue warning systems: http://www.road-tech.com/queue-warning-system . Please let them know what you think of it! Why Aren’t Queue Warning Systems Used On Every Project? Those of us that have been in the work zone ITS industry for several years understand that agencies don’t change quickly. New technology must be tested and evaluated before it is used on a more regular basis. We get that. But we are now at the point where queue warning systems should be included on every project where frequent and dynamic queuing is expected. Studies by the Texas Transportation Institute have shown a reduction in rear end crashes of as much as 45%. Crash severity is reduced as well. Other states including Illinois have also seen a dramatic decrease in crash frequency and severity. These systems are inexpensive and the benefits are substantial. Avoid just one lawsuit by using queue warning and that savings will more than pay for the cost of the system. So it does not matter how long the project lasts. Projects lasting only a few days could deploy a system for something like $700 per day.Projects months long would pay something like $10,000 per month. Those prices include the sensors, message signs, communications costs, design, set-up, etc. One law suit will cost tens if not hundreds of thousands of dollars. It really is that simple. And that doesn’t take into account all of the other benefits. Fewer crashes mean the project is completed faster. Motorists are happier with the DOT because they aren’t experiencing long delays. And you will have the data to meet the Federal Work Zone Safety & Mobility Rule requirements for work zone performance measurement. There has been progress. Texas is moving toward statewide use of queue warning systems. Illinois is also. Several other states are working on following suit. But most states only use them on special high impact projects. Some don’t use them at all. So, I really do want to know. What is holding you state folks back? Why don’t you use these everywhere? I sincerely want to know. Please comment on this post. Let’s talk about it. Perhaps as a group we can find ways around the road blocks you face. And together we can significantly reduce the single largest cause of work zone fatalities nationwide. We are starting a new construction season so I thought it would be a good time to review our progress as an industry, look at where we stand today, and talk a little about prospects for this coming year. 2015 was an important year for all of us. 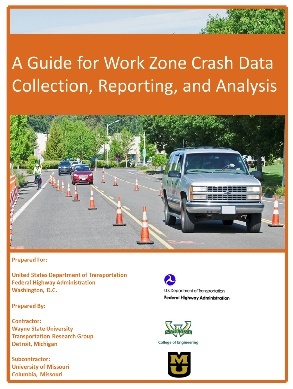 It was in 2015 that we began to get good hard data to support the value of work zone ITS. 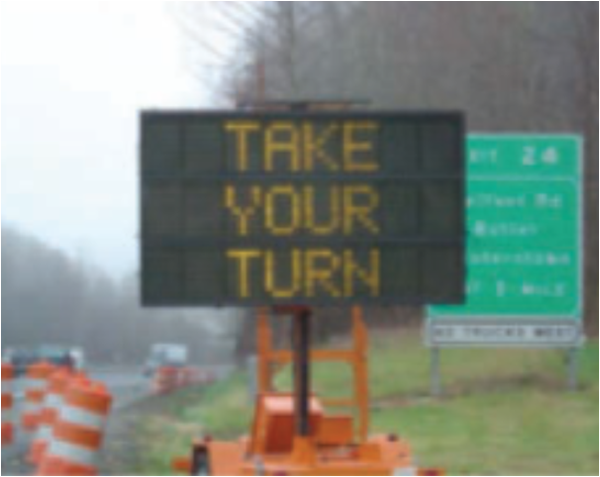 The Texas Transportation Institute led the charge with their My35 queue warning system research. Their data is not final, but it is clear that use of a queue warning system has reduced end of queue crashes by as much as 45%. It has also significantly reduced the severity of the crashes that do still occur. We have always known these systems are effective. Now we can prove it. Illinois DOT has shared data from work zones on a stretch of interstate under construction two years in a row. The first year a queue warning system was not used. The second year one was used. In that second year the work zone was in place for a longer period of time, yet they saw far fewer end of queue crashes just as they did in Texas. This data will result in much greater use of end of queue systems. Another effort that is helping is the Every Day Counts initiative from FHWA. They just completed webinar number 12 of the Smarter Work Zones series. This focus on proven work zone ITS and how to deploy it has done wonders to promote these life saving technologies. You can view any of these webinars now at: https://www.workzonesafety.org/swz/webinars/ . More good news came on the procurement front. Agency design folks have passed up work zone ITS in the past because they didn’t know how to write it into their construction bid documents and didn’t have the time to figure it out. But now states like Texas, Iowa and Illinois have shown us the way with innovative on-demand contracts for queue warning systems. This allows the traffic operations folks to use these systems when and where they are needed. Including systems in large jobs still makes sense, but this on-demand method allows far greater use on smaller jobs where traffic impacts were not clear before the job was let. Many other states are now adopting this model including Indiana, Michigan and North Carolina. As more and more states begin to use work zone ITS, the resulting data can be used to prove the value of these systems once again. And that will push even more states to follow suit. In the meantime, we are seeing help from another, unlikely source: the autonomous vehicle industry. Discussions at autonomous vehicle events between their designers and work zone ITS practitioners have shown great potential for collaboration going forward. They now understand they need to know where work zones are located in real time and they are interested in how we can help them do that. Don’t be surprised if we hear several big announcements on this subject in 2016!